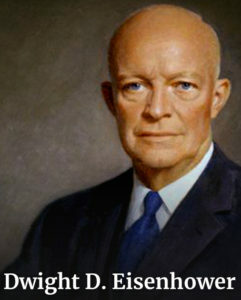 You are here: Home » Blog » Blog » What Would President Eisenhower Say? Reading time – 39 seconds; Viewing time – 2:14 . . .
That causes me to remember times when I’ve heard CEOs complain that people always seemed to want more from them. These CEOs would respond with some version of, “I pay them to do their jobs.” This was always said with the clear implication that money should be enough to get people’s best efforts. There’s something of an “assault,” I think, embedded in that view, as it suggests that clubbing people over the head with a paycheck is leadership, the very thing required to get best effort. I don’t think that’s right, though, and I don’t think Eisenhower would have thought so, either. 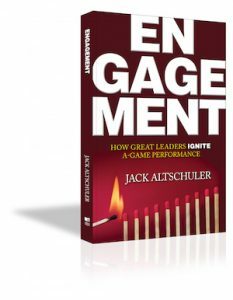 Best efforts – people’s A-Game, as I illustrate in my book, ENGAGEMENT: How Great Leaders Ignite A-Game Performance, comes about through the influence of the stuff that grabs we humans in the gut. The studies show conclusively and repeatedly that acts of caring, the fundamental of all relationships, is at the core. It’s demonstrated by showing interest, like asking questions, listening, calling on people to be their best, but only because they’re too important to be anything less than their best. Take note of the human qualities of what Eisenhower believed and the embedded, “I care about you” message in them. It’s what great leaders do.